The global geospatial imagery analytics market size set to reach USD 21.9 billion, growing at a CAGR of 32.3% during the forecast period. The growth of this market is attributed towards technological upgradations in this market along with increased competitiveness among the key players operating in geospatial imagery analytics market across the globe. Geospatial analysis enables the business enterprises in operating, integrating, displaying, gathering and examining geospatial data that is collected with the help of geotagging, satellite imagery and mapping that is crucial for generating vital information that is further utilized for the enhancement of existing business operations. Another factor pertaining towards the growth of global geospatial imagery analytics is that this system provides extensive precision to images in both 2D and 3D analysis. On the basis of type, the global geospatial imagery analytics market is segmented into video analytics and imagery analytics. Among these two types of geospatial imagery analytics systems, video analytics is expected to grow at higher CAGR of 36.9% during the forecast period. 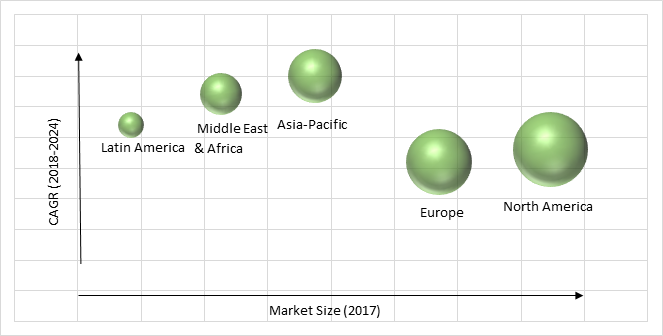 The growth of this segment is attributed towards excessive demand for drone and satellite video surveillance across various industry domains worldwide. Based on collection medium, the geospatial imagery analytics market is segmented into satellites, geographic information systems (GIS), unmanned aerial vehicles (UAVs) and others. Among all these segments, UAVs segment is anticipated to witness the highest CAGR of 36.7% during the forecast period. The growth of this segment is accounted towards extensive embracement of UAVs pertaining to cost-effectiveness as compared to those developed by other collection media. On the basis of application, the geospatial imagery analytics market is segmented into geospatial data acquisition and mapping, surveillance and monitoring, disaster management, construction and development, exhibition and live entertainment, energy and resource management, and conservation and research. Among all the applications, surveillance and monitoring hold the largest share in the market during the forecast period since this technology occupies extensive opportunity to the business enterprises related to problem-solving and effective decision-making ability for enhancing the smooth functioning of the organization. Moreover, due to enhanced usage of this technology defense and military domain is rapidly adopting this technology across the globe. Based on vertical, the geospatial imagery analytics market is categorized into agriculture and forestry, government, energy and mining, healthcare and lifescience, civil engineering and archaeology, defense, media and entertainment, and others. Among these segments, healthcare & life sciences segment of the geospatial imagery analytics market is anticipated to witness the highest growth during the forecast period. The growth of this segment is attributed towards swelling disposition of geospatial imagery analytics solutions in the health management of people along with availing them with valuable healthcare services. The increasing acceptance of video-based imagery is the key trend observed in the growth of geospatial imagery analytics market across the globe. In video-based imagery data is kept in video-recording format due to the presence of imagery analytic services. Moreover, increasing number of nano and small satellite launches is another trend pertaining towards the growth of the global geospatial imagery analytics market. Furthermore, the existence of a large number of satellites across the world implies high-revisit rates and enhanced frequency of data. Technological advancements in geospatial imagery analytics market by key players are the major factor that is driving the growth of the geospatial imagery analytics market. The latest technology such as big data and artificial intelligence enables various business enterprises to perform efficient and speedy analysis of data as a result key providers are extensively assimilating these technologies for delivering vital insights in reduced amount of time. Moreover, it has been observed that various industries such as healthcare, banking, financial services and insurance (BFSI) and retail and e-commerce industry are the key beneficiaries of these evolving technologies that are helping them in extracting useful information and further classifying a large amount of data. Increasing government compliance pertaining to geospatial data is hindering the growth of the geospatial imagery analytics market. The government policies comprising of geospatial data are stringent due to risk related to the breach of data and utilization of this data for unfair means. Furthermore, integration of geospatial imagery analytics data with enterprise solutions is another factor that is expected to hamper the growth of the geospatial imagery analytics market in the near future. Geographically, Europe is estimated to generate the largest revenue and is further anticipated to witness significant growth during the forecast period. The growth of geospatial imagery analytics market in this region is attributed towards increased infrastructural development for calibration and image collection that provides a satisfactory business environment for effectively administering its business operations. The Asia-pacific geospatial imagery analytics market is expected to grow at the fastest rate during the forecast period. Globally, geospatial imagery sensors industry players are leveraging market growth through enhanced product portfolio, mergers and acquisitions and successful distribution of requisite services to end-users. The key players operating in the geospatial imagery analytics market such as ESRI, MDA Corp and DigitalGlobe Inc. are excessively investing in research and development for relatively longer time duration and are also performing mergers and acquisitions for robust dissemination in the market. The key players operating in the geospatial imagery analytics market include Satellite Imaging Corporation, Hexagon AB, DigitalGlobe, Google Inc., UrtheCast Corporation Esri, Fugro N.V., Harris Corporation, Planet Labs, and Trimble. Note: Financial insight and recent developments of different companies are subject to availability of information in secondary domain. Table 235 Snapshot – Google Inc.
Table 237 Snapshot – Fugro N.V.